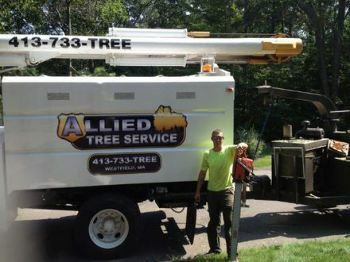 ALLIED TREE SERVICE IS THE AREA LEADER WITH 24 HOUR EMERGENCY SERVICE AVAILABLE. AT ALLIED TREE SERVICE, THEY PRIDE THEMSELVES ON DOING ALL TYPES OF TREE WORK FROM RESIDENTIAL TO COMMERCIAL INCLUDING BUCKET TREE SERVICE! SO IF YOU THINK YOU HAVE A TREE PROBLEM, GIVE THEM A CALL TODAY AND A CHANCE TO BE YOUR SOLUTION! CALL 733-TREE!!! (413-733-8733) ALL MAJOR CREDIT CARDS ACCEPTED!! !